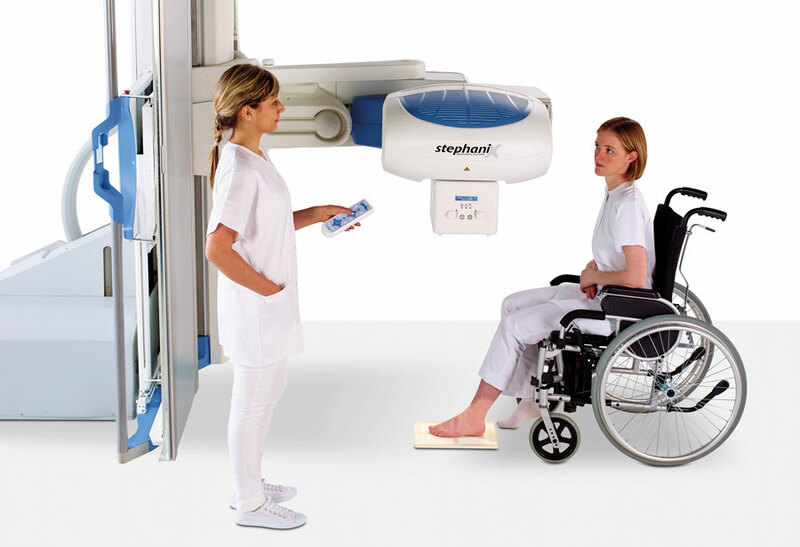 The Stephanix DR/F is a remote controlled multifunctional R&F system with angle projections of 90 degrees vertically and -25 degrees (for trendelemburg) with variable table height. The system features cutting edge technology in high resolution Direct Digital Acquisition systems, Direct Digital Acquisition HIRIS RF43 Include Digital dynamic FPD Trixell 4343RF 43x43cm. DR/F INTEGRATES ALL THE EXPERTISE OF STEPHANIX IN TERMS OF EASE OF USE, ERGONOMICS AND EFFICIENCY. Unmatched patient coverage, true rear access as well as high sturdiness to carry patients up to 310 kg. Compact high-end system integrating electronic components directly into the base of the table. Patient workflow automated via procedure code mapping and an Intuitive User Interface. Outstanding image quality at low dose with our latest generation of dynamic Flat Panel Detectors. Powerful processing consoles, ergonomic, and DICOM 3.0 compatible. 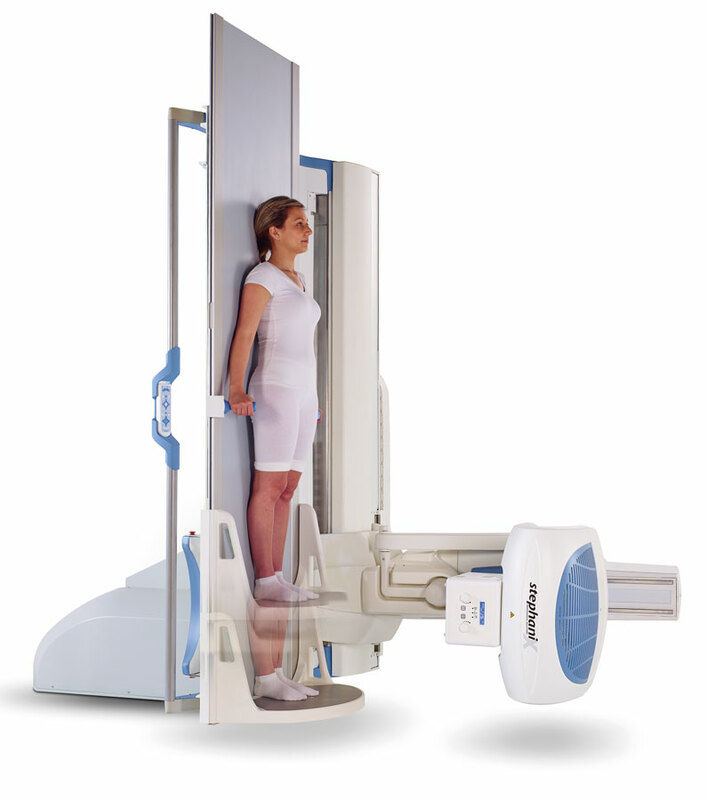 RADIOGRAPHY – All routine radiographic examinations can be completed in a simple and ergonomic way. Anatomical protocols ensure high image quality for all patient profiles and types of exams. 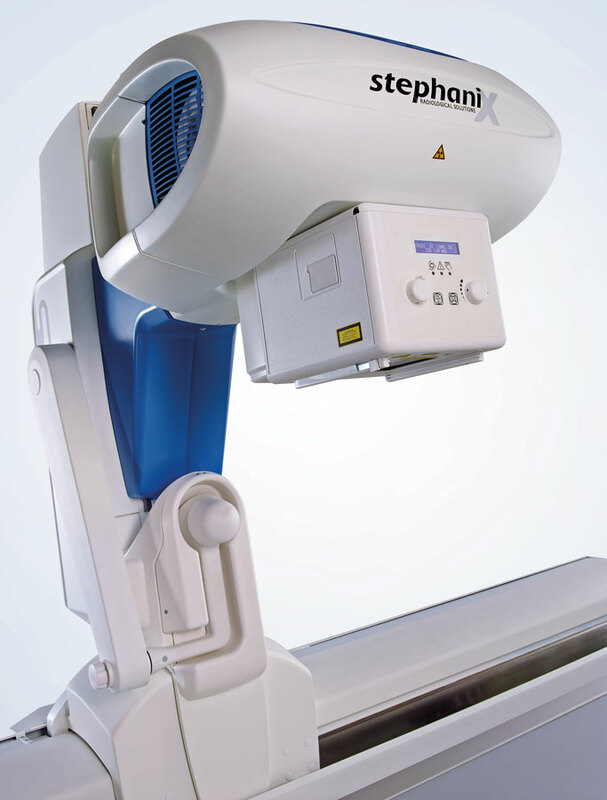 FLUOROSCOPY – The DR/F high-end dynamic detector supports all fluoroscopy exams with complete control of the acquisition rate, image quality and emitted dose. TABLE-TOP EXAMS – The ability to perform table-top examinations with DR/F guarantees great versatility, allowing you to work in an optimal configuration for pediatric examinations, extremities and also for exposures on stretchers or wheelchairs. Column Angulation – The tube holder column describes a full angle of +/- 40°, which offers complete coverage of the tabletop, including exams requiring oblique rays such as shoulders or knees. DR/F simplifies taking x-rays on stretchers and/or wheelchairs. Carriage – The longitudinal displacement of the column / detector assembly allows complete patient coverage and ensures high versatility with table in vertical or horizontal position. 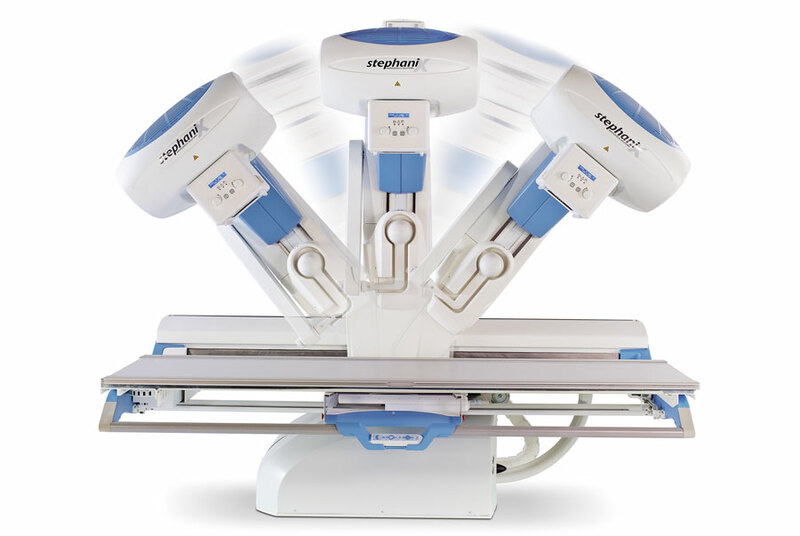 Longitudinal Movement – The longitudinal and lateral movements of the tabletop join the column angulation and the carriage, to ensure complete x-ray coverage of the entire tabletop. Thus, once positioned on the table, it is no longer necessary to move the patient. Unsurpassed Rear Access – Smart access: the 120cm extension of the tabletop for true rear access for operators. The flat tabletop enables the transfer of the patient from the stretcher to the table effortlessly. Sturdiness – DR/F extreme robustness supports lying patients up to 310 kg. To enable simple positioning of the most difficult patients, DR/F has no limitation of movements for patients up to 230 kg. Table Foot Rest – The motorized displacement of the tabletop with the attached foot rest allows effortless studies such as weight bearing knees or feet. To ensure this functionality even for the most difficult patients, this motorization is available for patients up to 230 kg. Source Image Distance – The Source Image Distance of DR/F is continuously variable from 110 to 180 cm. An ideal feature for thorax examinations. Tube Rotation – The tube rotation of DR/F offers even more versatility for maximum ergonomics. Minimum Height – The variable height of DR/F allows comfortable examinations of patients in wheelchair. Maximum Height – The high position of DR/F facilitates working in standing position. Tilting – DR/F quickly tilts from the horizontal position to the vertical position. Trendelenburg – DR/F tilting in Trendelenburg facilitates the achievement of numerous exams. Automation By Protocol – The “MOVE” button activates an incredible number of automations resulting from the choice of an anatomical protocol in the acquisition console. Table Console – Intuitive and ergonomic, the control console allows an extremely fast and easy positioning of the DR/F. Its joysticks control up to four movements simultaneously. 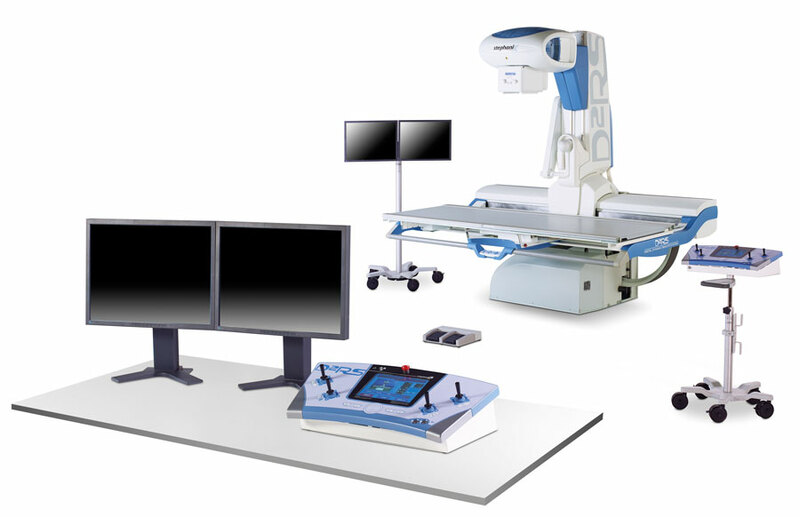 From its touch screen, you will have access to all information on the positioning of the table, to the video camera for positioning, and magnification modes in fluoroscopy and for adjusting generator parameters. Acquisition Console – Incredibly ergonomic, the acquisition console is fully integrated into the IT system dedicated to radiology (DICOM, HL7, etc.) and its interface makes easier the management the entire system. The automation of the movements of the table, collimation, additional filtrations, generator parameters and image processing are accomplished simply by choosing an anatomical protocol. 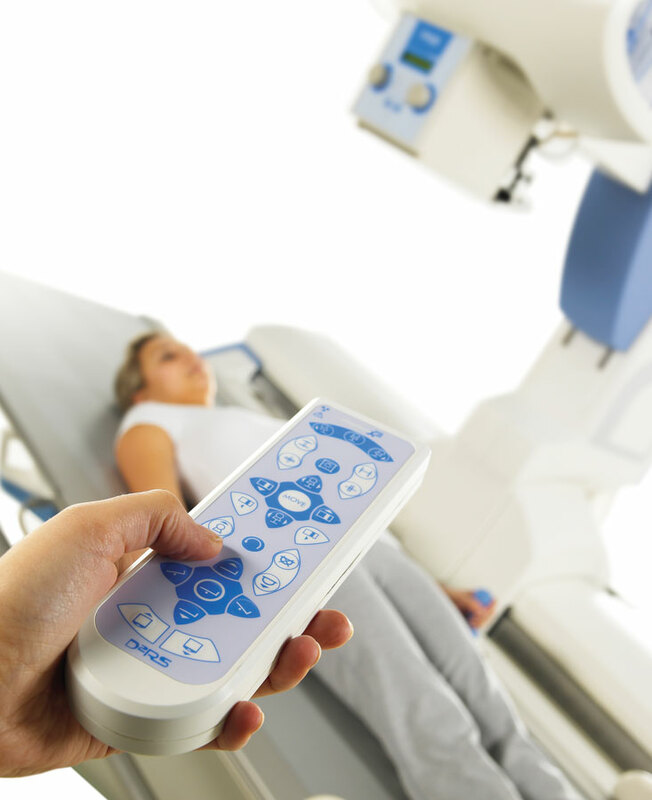 Wireless Remote – The wireless remote control of DR/F includes all the controls, including the autopositioning button to move the table. Magnetic, easily fits into the holder in the center of the table, and can be also used as a secondary control console. 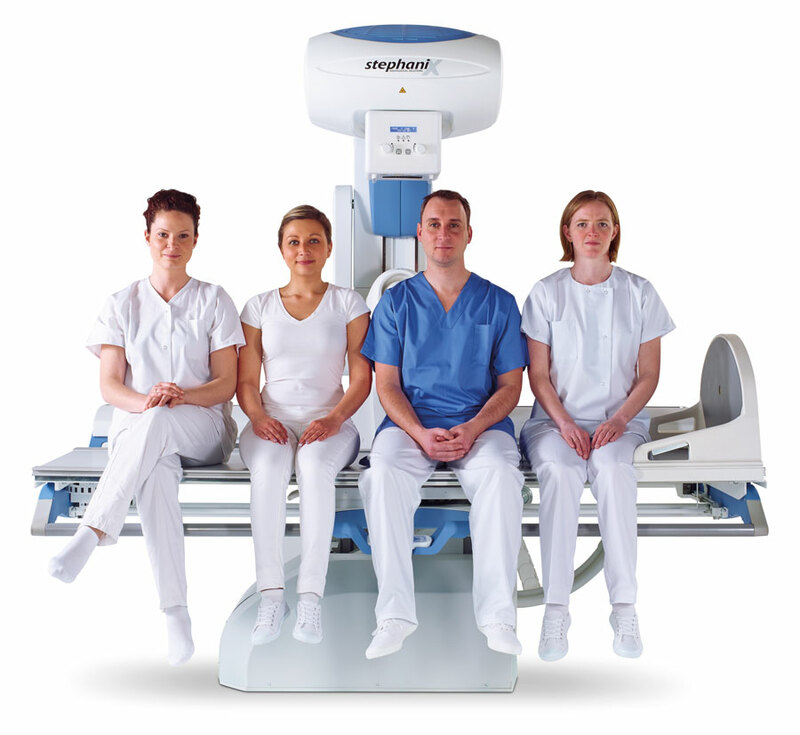 DR/F was designed to provide the best image quality / dose for each exam in radiography or fluoroscopy. This performance is possible thanks to the combination of a very high-end dynamic detector with powerful image processing software and the addition of dedicated mechanical characteristics such as very small Tabletop / Detector distance, video camera to confirm position automatic additional filtration, etc.